Hi everyone! 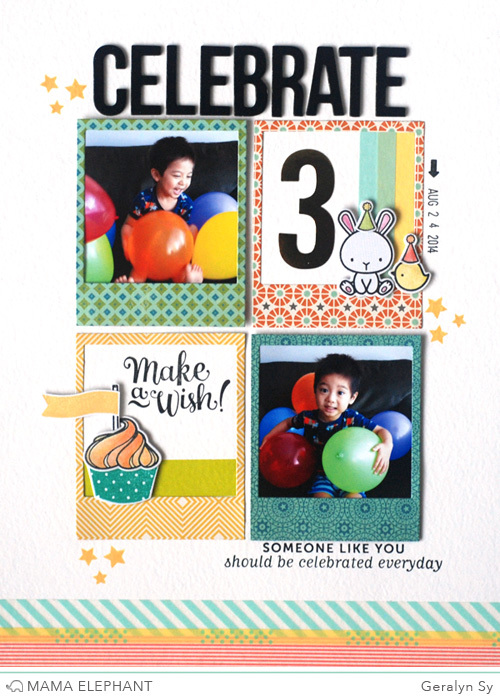 Geralyn here today, sharing a festive layout I made documenting my nephew's 3rd birthday. I had lots of fun with Mama Elephant's new Polaroid Fun Creative Cuts as well as the adorable August stamp sets. Though the stamp sets are awesome for cards, I wanted to show you how versatile they can be for scrapbooking as well! I started by using the Polaroid Fun Creative Cuts to make four patterned paper frames for my layout. I used two frames for photographs and decided two frames would be for embellishments. For the top frame, I added a large gold foil number 3 and a few strips of washi tape. I thought it would be cute to add some of the animals from Carnival Cupcakes and Carnival Toppers to the corner of the frame. The rabbit was fitting since my nephew was born in the year of the rabbit, and I had to add the little chick as his friend :) It was really easy to cut them out with the coordinating Cupcakes and Toppers Creative Cuts. I colored the animals and party hats in with watercolors and adhered them with foam adhesive for some added dimension. For the bottom frame, I added another strip of washi tape and used the Carnival Cupcakes and Carnival Toppers stamps and coordinating dies again to include a little cupcake. I also pulled out Mama Elephant's Make a Wish stamp set because the stamps were perfect for this layout. 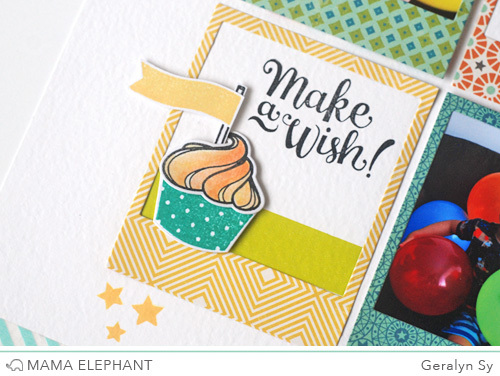 I love that handlettered 'make a wish' stamp and the stars added a touch of whimsy. And there you go! 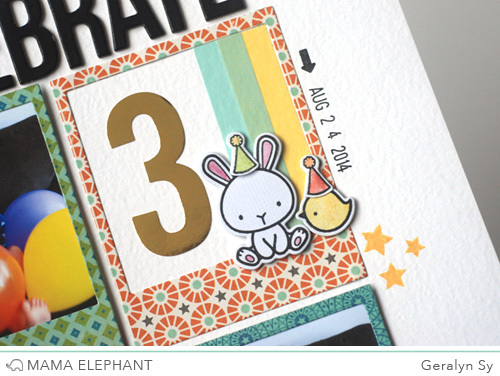 A simple and clean birthday layout thanks to the cutest stamp sets. It was quite simple to put this together too since I had used the Polaroid Fun Creative Cuts to create the grid design. Thanks for stopping by! Also, remember the Mama Elephant September Challenge starts today! This is beyond adorable! Such a lovely idea using the polaroid frames, and the embellishments are so sweet! Thanks so much for sharing. Such a fun layout, Geralyn! The only thing cuter than the images and cupcake is that darling little birthday boy...so CUTE!! !